YCRC at Head of the Charles 2018. It’s on many rowers’ bucket list, but what is it like to race the Head of the Charles? 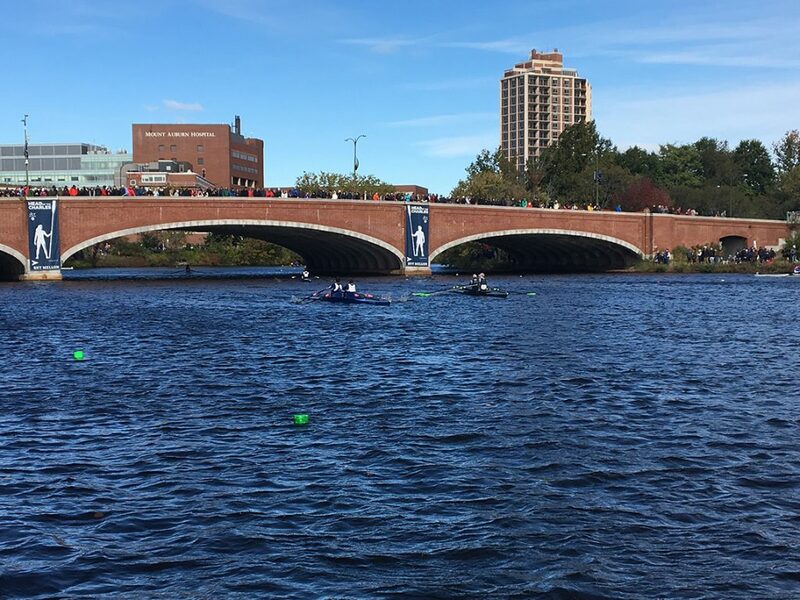 This autumn, two of our Leisure and Progression rowers, Hilary & Paula, found out as they crossed the pond to race in a gorgeous Massachusetts fall. The Head of the Charles Regatta, held in Boston since 1965, is one of the most popular & prestigious races in the USA, if not the whole world. Held over the third weekend in October, 2018’s 54th event attracted a total of 10,282 athletes representing 805 clubs. 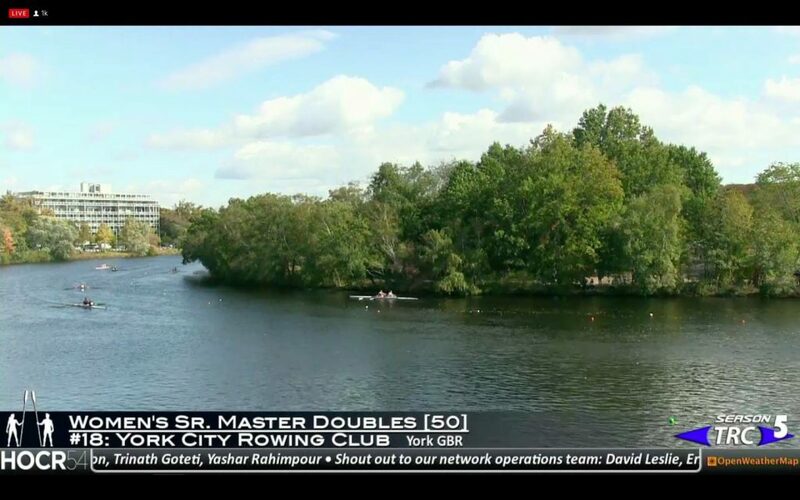 So how did we end up racing on the Charles River? Last summer a rower from Boston who’d been rowing at Henley Royal Regatta, came up to York and wanted to do some training whilst he was here. Somehow, he ended up sculling with Leisure & Progression Group on a few weekday mornings and – during the regular post-session coffee session – told us about the HoCR, with which we were unfamiliar. So a plan was formulated: why not have a go? 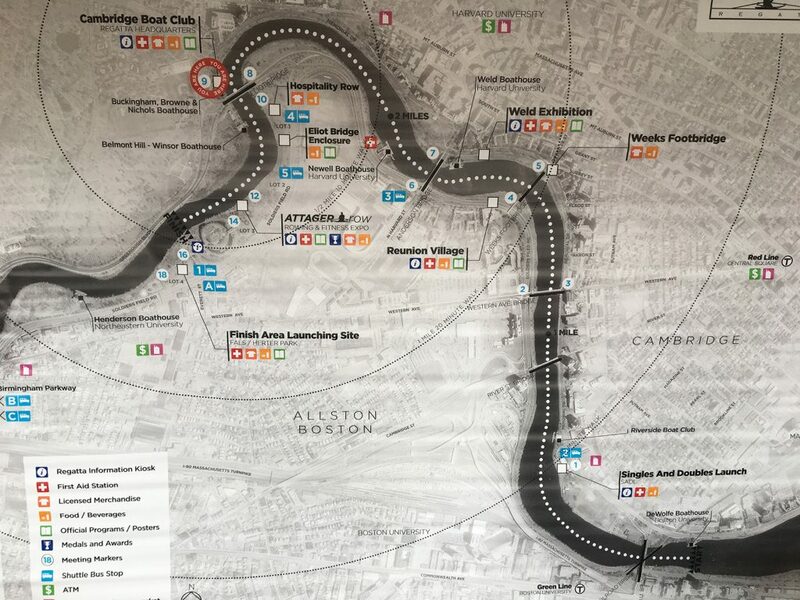 We were given a contact in Boston from whom we could hire a double and in early April this year, we submitted the mandatory rowing (& especially steering) CV to the HoCR website. Being able to say we’d previously done the Pairs/Vet Fours Tideway heads, plus Masters Henley a couple of times, and other assorted events without incident seemed to satisfy this requirement and our entry was accepted within 24 hours. Then over the next couple of weeks, it was just a question of sorting flights, accommodation & the ESTA. Fast forward to this October….we were on a 777 flying into Logan Airport. The next morning we climbed into a shiny new Filippi 2x and pushed off to scull on the Charles River. Two days of practising the course (highly advised!) and navigating the tight bends & tricky bridges – often the two features coincided – and we felt as ready as we could be. Race day was cool & blustery (thankfully not as blustery as practice day one, when the white-tipped waves in the downstream marshalling area were some of the biggest we’d ever sculled through) but fairly sunny. Fairly soon after the start and the double road/rail bridge, opposite our host club, we overtook our first boat and relaxed a bit. At least we weren’t going to come last. Hilary & Paula on the course at HOCR18. Photo: L. Howe. Keeping it strong, long and loose over 3 winding miles upstream requires some serious concentration and stamina, but the ever-changing course and wind directions helped us keep the focus. Before we knew it, we’d passed the one, then the two mile marker buoys and negotiated the notorious Eliot Bridge (the last of 7). Successfully through, we kept it hard on stroke side (or more correctly, ‘port’) for the final sweeping bend to the finish at the 3 mile mark. Turning after the designated blue buoy, we enjoyed the relaxed return paddle downstream to our host club, cheering on the crews who were racing hard upstream next to us. We were happy to have completed the course in 22.50.787, coming a respectable 17th out of the total number of 36 Women’s Senior Masters Doubles crews. All in all, it was a FABULOUS experience, a challenging, well-organised event and a very friendly atmosphere. We would definitely recommend it to anyone thinking of competing in the US. Competitors at HOCR 18. Photo: H. Howe.